Three new members have been appointed to the Government’s Advisory Committee on Releases to the Environment (ACRE). ACRE is an independent advisory committee composed of leading scientific and farming experts. Its main function is to give statutory advice to Ministers in the UK and Devolved Administrations on the risks to human health and the environment from the release and marketing of genetically modified organisms (GMOs). It also advises on the release of certain non-GM species of plants and animals that are not native to Great Britain. Simon Kerr, Head of Regional Trials for the National Institute for Agricultural Botany - expertise in agronomy and farming practice. 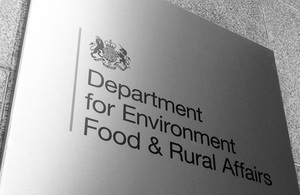 These appointments have been made following agreement by Defra ministers and the Devolved Administrations, to whom ACRE also reports. The new members have been appointed for three years and will receive the standard fee of £173 for each day spent attending ACRE meetings or on other ACRE business (estimate of 20 days per year). The appointments have been made in accordance with the Commissioner for Public Appointments’ Code of Practice for Ministerial Appointments to Public Bodies. All such appointments are made on merit and political activity plays no part in the selection process. However, in accordance with the original Nolan recommendations, there is a requirement for appointees’ political activity (if any declared) to be made public. Matthew Heard declared he had canvassed on behalf of a party or helped at elections but the others declared they have not been involved in political activities. None of the appointees declared any other paid ministerial public appointments. In addition five existing members have been reappointed for a further term on the committee from October - Professor Jim Dunwell, Professor Les Firbank, Professor Rosemary Hails, Dr Ieuan Joyce and Professor Andy Peters. Members of ACRE are appointed purely for their expertise and do not represent any stakeholder groups. The three new members have been appointed following a selection process regulated by the Office of the Commissioner for Public Appointments (OCPA) and the appointments had to be agreed by Scottish, Welsh and Northern Irish Ministers as ACRE has UK-wide responsibilities. Read the biographies and declared interests of ACRE members.